It was another opportunity to sleep in as the first flight from New York to Indianapolis was scheduled for 8:30am. I jest, but it was not a 3am wake up, so that makes me happy. Although, I am the one who books those 6am flights, so I only have myself to blame. With all my travel delays the past few months, I took it as a good omen that when I pulled into the parking lot at LaGuardia, the shuttle bus was right there waiting to go. But after killing time at LaGuardia, boarding the plane, and taking my seat, a fairly large gentlemen took his seat next to me. So I guess the ease of parking was a one off and not the omen I had hoped for. Upon landing in Indianapolis, I headed to the Alamo counter to pick up the rental car. Alamo has no express program, so it was a wait in the line. I am an Alamo Insider and all my information is in my account. So why was there so much paperwork? It was a phone book amount of paperwork. I know rental cars used to have this as a standard operating procedure, but every other company has reduced this at least a little bit. Not so with Alamo. Note to self. I did eventually get the car and headed out on the 90 minute drive to Muncie. This was a fairly boring drive and I did not pass The Frugal Hoosier. But I did pass signs for Skyline Chili. Not a pleasant memory (see the Cincinnati trip report). I would be on my own for the self guided tour of Ball State. You may have noticed no mention of Al thus far. Al would be flying in and meeting me at Ball State, as he has been in Vegas all week and was coming directly from there. And while Al did quite well on the reservations in Vegas, he did mangle something here, because he was not getting to Ball State until mid afternoon. That is too close for comfort to game time for me as I bank on flight delays now. Al would like to note for the record that this is on Delta for cancelling the one morning direct flight they had and rebooking him connecting through Fairbanks. Anyway, back to my solo self guided tour. The first thing to note is that Ball State has a very nice, tall bell tower in the middle of campus. Thus, it is not really possible to get lost as it serves as a beacon. 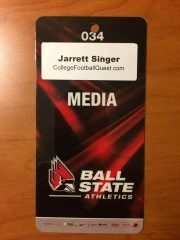 Secondly, Ball State University is where David Letterman attended as evidenced by the David Letterman Communication and Media Building. I did not see Mr. Letterman on my tour. Bummer, as I was always a Letterman over Leno guy. Thirdly, this campus has people, unlike our last stop. And a lot of people. It was quite refreshing to see at midday on a Thursday. Next stop was the student union, which was surprisingly difficult to find and quite poorly marked. Lunch consisted of a burrito which was quite good for school food. Watch out Chipotle, as I would definitely eat at the Ball State student union before Chipotle, a dying franchise that should be shut down immediately. No, I will not rest until Chipotle is no more. After lunch, I went into the bookstore for the usual purchases. Then it was a self guided facilities tour. This means that I wandered into the basketball arena. A bit more wandering around and then headed off to check in at the hotel. I checked in at the Muncie Fairfield Inn. I rejected the first room as too noisy and resigned to accepting the second room. This location is not up to Fairfield Inn standards. This hotel was clearly a lesser brand in a previous life and not much was done to clean it up. If this location meets the Fairfield Inn brand standards, then it is just barely and the standards are too low. With time successfully killed, I did head out to pick up Al who wanted to go to the bookstore before the game. Al took an Uber from the Indianapolis airport. He indicated it was a “pleasant” ride and as a bonus included a bathroom stop for the driver at White Castle with no burgers being consumed. How does that happen? I did successfully pick up Al and his checked bag right in the middle of campus. 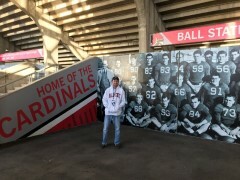 Al did get his Ball State sweatshirt for the game and then we headed out to the stadium. We arrived at the stadium and after a bit of consternation about where to park so as not to get trapped in the lot, a conversation that would later seem absurd based on the attendance and score, we headed inside. Quick note, the Ball State list of prohibited items includes “missile type objects”. Doesn’t this fall under self explanatory. The logic that includes that item should also state a ban on hand grenades and nuclear bombs. Also, the catch all at the bottom of no objects deemed inappropriate for stadium events seems a bit vague and I have questions. We headed upstairs and met up with Michael who was taking care of us on this trip. We had a great conversation and gained some great insight into Ball State before heading down to the field for what has become our pregame ritual. The usual photos and scouting took place. In case I have not mentioned it to this point, it was cold. We did stay outside for awhile but eventually made the wise decision to head inside and upstairs, which is where we would watch the game. We both pick the Toledo Rockets. The game started out well for Ball State as the first quarter went the way of the Cardinals leading to a 7-3 Ball State lead. This turned in the 2Q as Toledo scored 3 touchdowns to lead 24-10 at the half. The Toledo Rockets blew the doors off during the 3Q, scoring 4 touchdowns in 7 offensive plays. Wow. Toledo led 51-17 at the end of the 3rd, on their way to a 58-17 win. And that is all that needs to be said about that. I will note that there were a few scouts present to watch Toledo QB Logan Woodside. According to my scouting report, he did not have a great game. He finished 8 for 17 for 267 yards and 3 td’s. But he missed many open receivers and his reads looked slow. Is he headed to the NY Giants? After the usual post game field pics, we headed out to grab some food. Not much was open and Applebee’s it was. It would have to do. We started off Friday by heading back to Ball State to get some school sign pictures. This is something we aim to do at each stop, but don’t always succeed. Ball State had good signs. It was then time to head out on the drive back to Indianapolis. Did I mention this is a boring drive? We had different flights and our coordination was not the best as Al had an early flight and I did not. I am suspicious and have launched an investigation. So I made myself comfortable. One bright spot about this wait was lunch at Harry and Izzy’s. I had an excellent St. Elmo prime rib sandwich. I know St. Elmo’s is an Indianapolis steak house that gets great reviews and I do not know the connection between St. Elmo’s and Harry and Izzy’s but this was a great sandwich. If these are affiliated (which I subsequently learn they are), St. Elmo’s is now a priority at the next pass through Indianapolis. Of course when time came to board my flight, I learn the flight is delayed because of flight attendants headsets not working.. Are you kidding me? Now, this was not a delay that had a predictable length of time associated with it. So the flight was delayed in 30 minute increments. It eventually got pushed to the point where the flight across the aisle going to JFK (instead of LaGuardia, where my car was) was looking good. I successfully moved onto that flight right when they announced the flight to LGA looked good for the same time. I got into line to switch back to LGA, when they announced, “fake news”, and delayed the flight again. I went to JFK and then took an Uber to my car. I have not looked at what time the LGA flight landed because I do not really want to know. I am sure it beat me to LaGuardia. This was not an ideal season for the Cardinals. 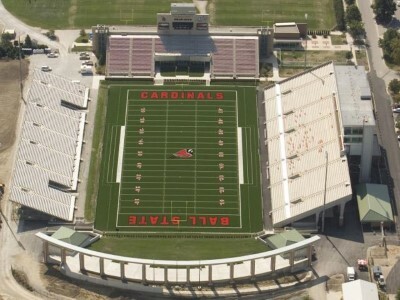 After starting 2-1, Ball State would lose nine in a row to close the season at 2-10, 0-8 in conference play. Toledo on the other hand would finish 11-2, winning the MAC West and beating Akron in the MAC Championship game. This earned a spot in the Dollar General Bowl, losing 34-0 to Appalachian State. For our Ball State photo album, Please click here. You can view as a collage or run as a slideshow. There are comments to explain what is in the photo but most are self explanatory. Thanks to Google, I can no longer embed the slide show with comments. I spent some time in Muncie, once for a Basketball game vs WMU, once to look at a large asbestos job on campus. If I had 6 months left to live I would move to Muncie as it would make my time there seem twice as long. 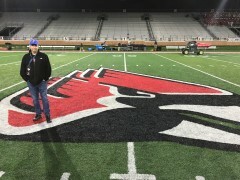 Seriously, I am sorry you had to visit CArdinal Stadium for a #MACTION game and someday I will fly you back to Kalamazoo so you can give our city it’s just review. We were shorted on your review of our city which has much TALENT and 17 Breweries. We did not see much of the city of Muncie so I can not comment on that. The campus was nice. We have been to better but we have also been to worse. We did short Kalamazoo but sometimes that is just the way it goes. We have to do 130 of these trips so some are going to come up short. Just be careful about inviting us back because one day we may take you up on that.